Borrowed from Yiddish ייִדיש‎ (yidish, “Jewish, Yiddish”). 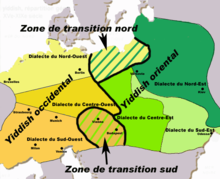 From English Yiddish, from Yiddish ייִדיש‎ (yidish), from Middle High German jüdesch, from Old High German judeisc, derived from judo, judeo + -isc, the former from Latin iūdaeus (“Judaean, Jew”), from Ancient Greek Ἰουδαῖος (Ioudaîos), derived from Ῐ̓ούδᾱ (Ioúdā, “Juda”) + -ιος (-ios), the former from Hebrew יְהוּדָה‎ (yəhūḏāh). This page was last edited on 5 December 2018, at 13:36.